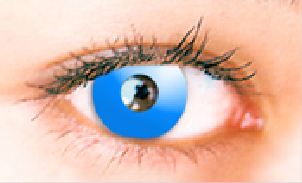 Soften your style with our Skye Blue Contact Lenses. These soft sky blue contact lenses will brighten up your entire face. The color sky blue refreshes and brightens up other colors placed next to it and bright sky blue contact lenses have a similar effect on your complexion. They brighten up the eye area and give you a fresh, youthful look.